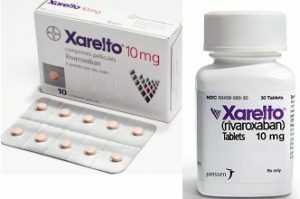 Xarelto is an anticoagulant (blood thinner) manufactured by Janssen Pharmaceutical that has been widely prescribed to prevent blood clots in patients suffering from atrial fibrillation (irregular heartbeat); dep vein thrombosis (blood clots deep within the body) pulmonary embolism (blood clots in the lungs); stroke; and patients who have recently undergone a knee or hip replacement surgery. It generally is prescribed as an alternative to warfarin (Coumadin), a blood thinner that began to be used in 1954. The U.S. Food and Drug Administration reported thousands of serious adverse events — hundreds of which were bleeding events — linked to Xarelto. While blood thinners are dangerous in general, Xarelto topped the list released by the Institute for Safe Medication Practices (ISMP) as the most dangerous. The drug is also on its list of high-alert medications, meaning it has a “heightened risk of causing significant patient harm” when used in error.The Xarelto lawsuits we have filed against the manufacturer of Xarelto (Janssen Pharmaceutical) and the co-marketer (Bayer Healthcare) states these companies failed to warn patients and physicians of the increased risks of fatal internal bleeding when using Xarelto. The complaint states that if these companies had warned of the risks, then patients would have been prescribed the drug warfarin, a medication in which internal bleeding can be treated with high dosages of Vitamin K.
The most serious potential side effect, complication and risk caused by Xarelto is severe internal bleeding that can result in death. Currently, there is no known cure to reverse the type of internal bleeding caused by Xarelto. Other potential injuries caused by Xarelto include infection associated with hip or knee replacement surgery; decreased hemoglobin (a substance that carries oxygen in red blood cells); bleeding in the brain; hematoma (a mass in the blood); peripheral edema (swelling of the lower limbs); and dyspnea (difficulty breathing). If you are currently taking Xarelto, it is important to do your best to avoid activities that could result in you getting cut, bruised, or suffering external or internal bleeding. If you do sustain these types of injuries (and especially if you experience swelling, bruising, bleeding, vision changes, confusion, weakness, dizziness or severe headaches), it’s important to immediately contact and inform your doctor. Additionally, make sure to inform all your doctors and dentists of your use of Xarelto, and especially before having any medical/dental procedures or surgeries, or if you have uncontrolled high blood pressure, abnormal kidney function, take medication associated with bleeding (e.g. aspirin), or abuse alcohol. We know that dealing with complications from Xarelto can be frustrating and debilitating. Legal options may be available for you. Call us today for a free case consultation at 1-888-291-2431 (toll free).You also can request a private and confidential consultation by clicking Submit Your Case button.